"There are names among us that are worth more than a thousand mail-clad knights apiece." 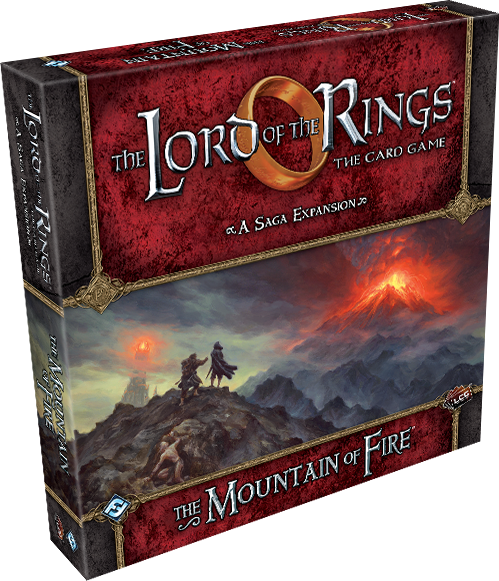 As The Mountain of Fire Saga Expansion for The Lord of the Rings: The Card Game carries your Saga campaign toward its climactic conclusion, the stakes are higher than ever. As we saw in our last preview, this is an expansion of truly epic and apocalyptic scenarios—full of Dire quests, deadly enemies, and treacherous events. 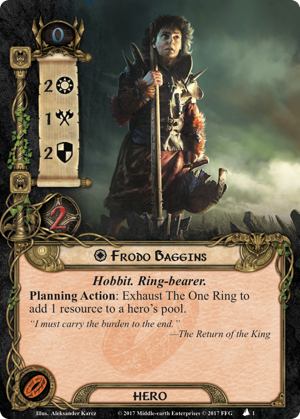 To face these threats and survive—to buy the Ring-bearer just a little more time to complete his journey—your heroes will need leaders who can to rise to the occasion. Of course, you'll have Frodo Baggins (The Mountain of Fire, 1) and Aragorn (The Mountain of Fire, 2), two heroes whose courage and commitment are beyond question. But who will you bring to join them? 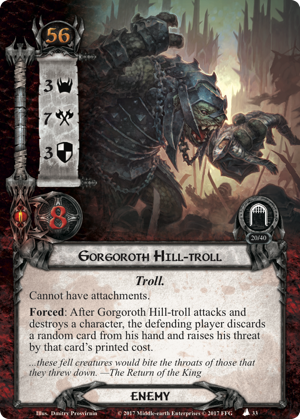 When you stand before the Black Gate, will your heroes tremble at the sight of the Uruks and Trolls arrayed before them? If so, you'll want to look elsewhere—you'll want to find a hero who will look at those dark hosts, raise his blade, and shout, "Guthwinë! Guthwinë for the Mark!" 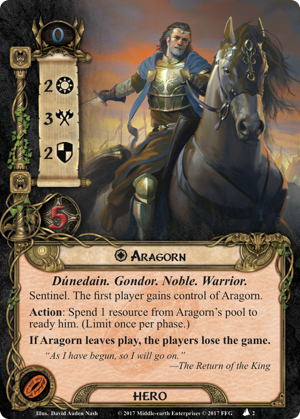 Although Éomer already made his The Lord of the Rings: The Card Game debut in The Voice of Isengard (The Voice of Isengard, 1), The Mountain of Fire reintroduces the Noble Rohan Warrior as a Leadership hero ready to lead the Rohirrim after his uncle's death. 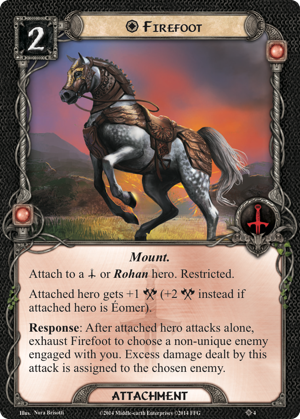 As the new king of Rohan, Éomer (The Mountain of Fire, 3) is no longer as reactionary as he first appeared in the Tactics sphere, but he's no less committed to the battle. Nor is he any less fierce a fighter. His ability no longer triggers after a character leaves play. 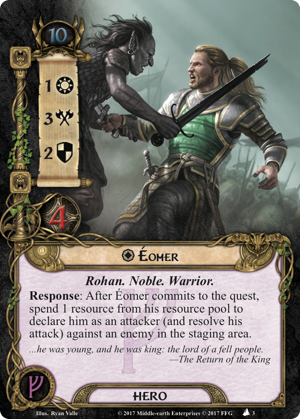 Instead, you can trigger it as you wish during the quest phase and spend a resource from Éomer's pool after committing him to the quest to declare him as an attacker against an enemy in the staging area. 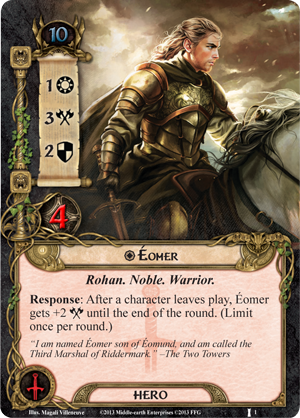 While it's true that Éomer no longer gains two bonus Attack Strength after a character leaves play, it's almost always better to destroy your foes before they can defeat you, and as a Leadership hero, Éomer can easily regain any of the Attack Strength he's lost by paying for a couple of Dúnedain Marks (The Hunt for Gollum, 2). 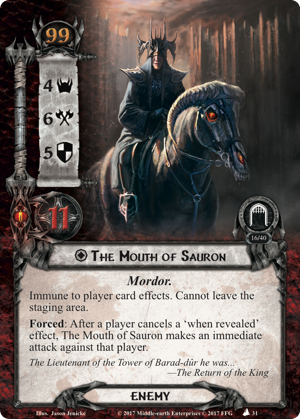 And while many of the foes he'll face at the Black Gate—such as the Nazgûl of Mordor (The Mountain of Fire, 32), Gorgoroth Hill-troll (The Mountain of Fire, 33), and The Mouth of Sauron (The Mountain of Fire, 31)—all boast Defense Strengths high enough to deflect Éomer's unmodified attacks, his status as the leader of Rohan entitles him to use such powerful Weapons as Spear of the Mark (The Morgul Vale, 137) and Guthwinë (The Mountain of Fire, 11). Armed with some Dúnedain Marks and Weapons such as these, Éomer can cut through his foes before they have a chance to assault the Rohirrim at his back. 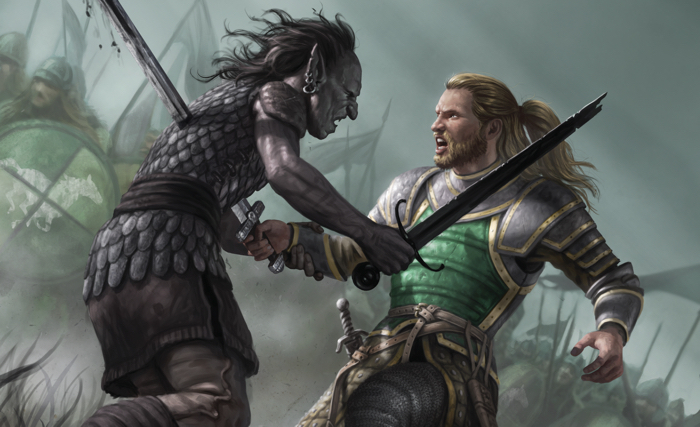 Moreover, while it's unclear whether Guthwinë, Éomer's named blade, bore any enchantment or special qualities, the sword has cut through enough Orcs and Uruks to have earned a reputation—the sort of reputation that works in two ways. It inspires fear in the wielder's enemies. And it inspires hope and courage in those who follow its wielder. 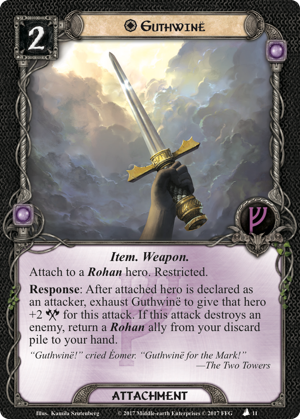 In addition to granting Éomer—or another Rohan—character a hefty two-point bonus to Attack Strength once per round, the blade can rally your Rohan allies, pulling them back from the discard pile so they can rejoin the fight. And this means that whenever the blade can help you destroy an enemy, it grants you access to any of the most valuable abilities among those of your fallen allies. 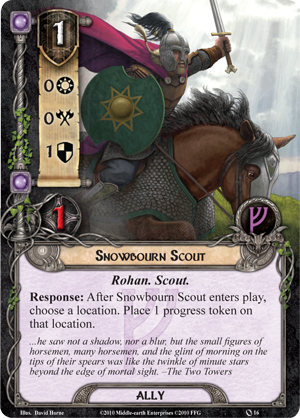 Pull back a Snowbourn Scout (Core Set, 16), and you can place a progress on the location of your choice before defending against a deadly strike. 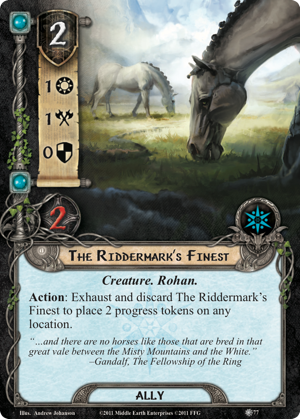 Pull back The Riddermark's Finest (The Hills of Emyn Muil, 77), and you can discard the Creature after questing to place two progress on the location of your choice. 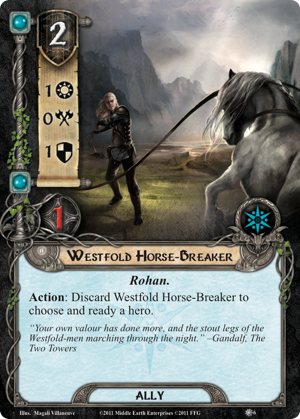 A Westfold Horse-Breaker (The Hunt for Gollum, 6) can ready one of your heroes. 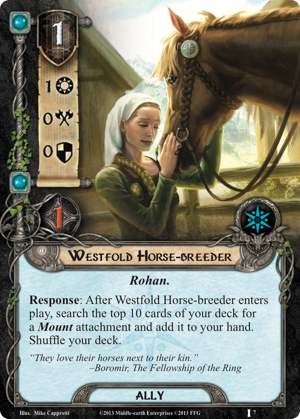 A Westfold Horse-breeder (The Voice of Isengard, 7) can help you fetch a Mount like Firefoot (The Dunland Trap 4). 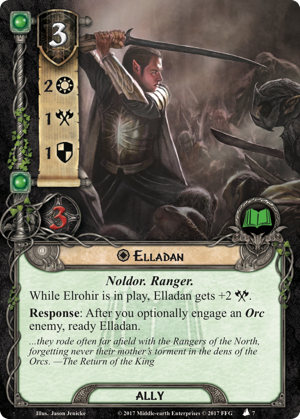 And allies like Grimbold (The Flame of the West, 4) and Hama (The Treason of Saruman, 7) can hold many of your enemies at bay. 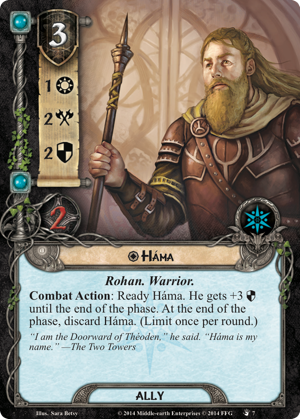 Finally, as it leads your heroes to a battle they know they cannot win, The Mountain of Fire introduces yet one more Rohan Warrior you can commit to the cause. 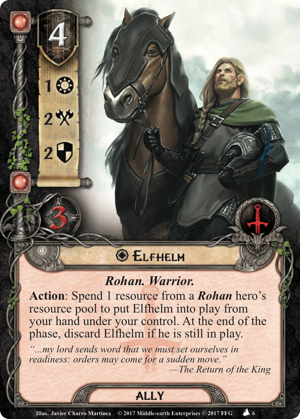 At a cost of four resources, Elfhelm (The Mountain of Fire, 6) might sometimes be difficult to bring into battle in the heat of the moment. 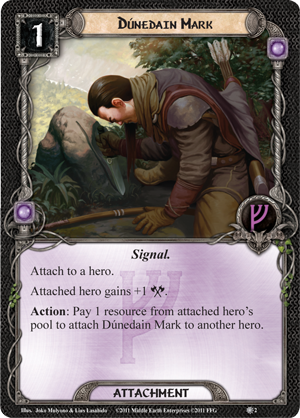 However, his unique Action ability allows you to bring him into play by spending one resource from a Rohan hero's pool. 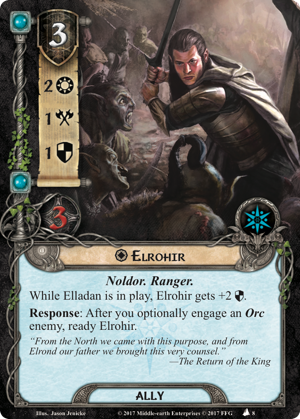 If you do, Elfhelm might interpose himself in harm's way, absorb some Archery fire, defend against a foe, and spare your heroes' lives at a critical juncture. 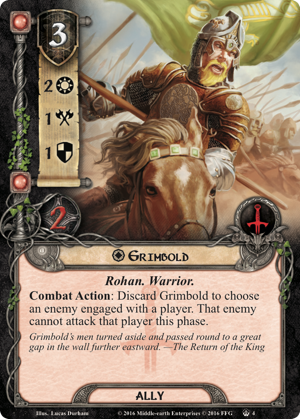 And the best part is that if Éomer can then use Guthwinë to cut through an enemy, you can bring Elfhelm back from the discard pile to use him again in the next round! 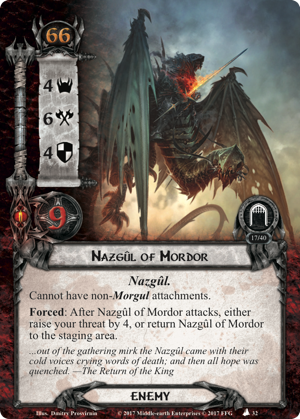 "The Messenger of Mordor laughed no more. . . . Rage filled him and his mouth slavered, and shapeless sounds of fury came strangling from his throat. But he looked at the fell faces of the Captains and their deadly eyes, and fear overcame his wrath." Poised at the end of your Saga campaign—and at the very end of the Third Age—the events captured in The Mountain of Fire are truly momentous, epic, and apocalyptic. You and your heroes will decide the fate of Middle-earth. Make sure you assemble the right fellowship! 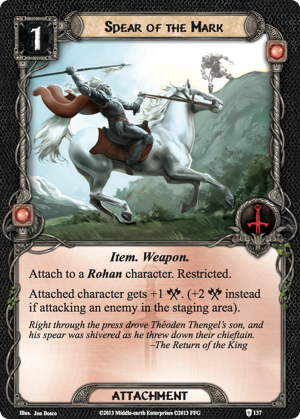 Whether you stand alongside King Elessar with Éomer and the Riders of Rohan—or you ride to battle with Elladan (The Mountain of Fire, 7), Elrohir (The Mountain of Fire, 8), and the members of the Grey Company—you'll find the new player cards from The Mountain of Fire may just give you a glimmer of hope amid the smoke and shadows of Mordor. The time for your Saga's final battles is fast approaching. Draw your blade, and calm your nerves. And if you haven't already, be sure to head to your local retailer to pre-order your copy of The Mountain of Fire (MEC62) today!